Marta Chilindron, Spiral 7, 2014. Acrylic, 76” overall, 40” high. Marta Chilindron, Cube 12 Multicolor, 2014. Acrylic, 12 in. x 12 in. x 12 in. Marta Chilindron, Ring, 2014. Acrylic, 30 in. overall. Marta Chilindron, Yellow Circle 12, 2014. Acrylic, 48” in diameter, 20” high, extends 8 ft.
Marta Chilindron, 9 Trapezoids, 2014. Acrylic, 72” overall, 30” high. Marta Chilindron & Graciela Hasper, Dialogues, 2014. Sicardi Gallery installation view. Installation view at Sicardi Gallery. Group Show, 2010. Raised in Montevideo, Marta Chilindron relocated to New York in 1969, where she attended the State University of New York in Old Westbury. While studying for her BFA, she spent two summers in the Camnitzer-Porter Studio in Valdottavo, Italy, in 1977 and 1978, studying printmaking. The dedicated focus on her studio practice during these summers abroad was foundational for Chilindron, and inspired her to pursue a life in the arts. In her early paintings, Chilindron looked to familiar settings and recreated them in paintings, but with dramatic changes in perspective. Her use of extreme foreshortening alluded to the artist herself, as if the viewer could see from the artist's line of vision. Chilindron calls these works "self-portraits," although she never painted her face. Instead, the paintings include the artist's hands or a foot, as she appears to move through the scene. In 1980, Chilindron took this approach to wood sculptures, in which she used the skewed perspective to construct basic furniture. These objects call attention to the relationship between the human body and its surrounding environment, a concern that Chilindron continues to explore in her work to date. In the early 1990s, Chilindron studied drawing with Julio Alpuy, an Uruguayan artist trained by Joaquín Torres-García. Combined with the technical and conceptual training she received in Italy, her studies with Alpuy provided her with a strong foundation in geometry and abstraction, from the perspective of the School of South. "This brought me back to a more concrete world," she observes, "exploring abstraction, but with geometry in it." Throughout the 1990s, Chilindron collaborated with conceptual artist Eduardo Costa to create a series of public interventions. In 1992, she and Costa created "Touched by Light," in which they projected an image of a hand on the facades of Manhattan buildings from a moving truck. The duo also created projects in Brazil and Chile. By the late 1990s, Chilindron had begun making collapsible sculptures, using hinges to allow the objects to be moved and changed. In 1999, she created a site-specific installation for El Museo del Barrio in New York. Titled Cinema Kinesis, the resulting project moved between being a flat plane on the ground to being a three-dimensional structure that consisted of three rows of movie theater seats and a screen. In 2000, Chilindron received a Joan Mitchell Foundation grant and began working with transparent materials. 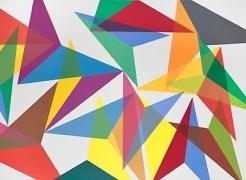 Her work has expanded to include the exploration of layered colors and moveable geometric forms. "I like to see all the sides of the work without walking around," she says. "You can stay still and walk with your mind around the works." "I am looking for the engine of life; what keeps everything together and functioning. I use movement because it implies instability and illustrates the continuous change of our uncertain realities." 1986: Permanent Installation, York College, CUNY, New York, NY, USA Marta Chilindron's work has also been featured in numerous group exhibitions, including Asterismos: Nuevas Visiones de la Abstraccion Geometrica en el Sur, Museo de Arte de las Americas, Washington, D.C. (2014);LA to LA, Selections from Sayago & Pardon Collection, LA Art Core, Los Angeles (2012); Fokus Lodz Biennale 2010, Lodz, Poland (2010);The Sites of Latin America Abstraction, MOLAA, Museum of Latin American Art, Long Beach, CA (2009) and CIFO (Cisneros Fontanals Foundation), Miami, FL (2006). For full CV, please download the PDF below.